The Cumberland & Dumfriesshire Farmers Mart P.L.C. 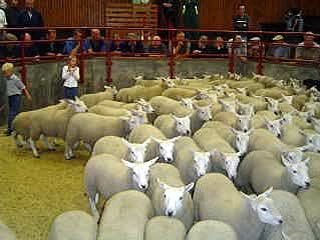 had forward 6,876 store lambs at their weekly sale at Longtown on Tuesday 27th October 2009. A large quality show attracted buyers from as far afield as Wales, all classes were again very dear. Top of £60.50 for Texels from Farlam Hill, £58.80 and £58.50 Greenknowe; Beltex £57.50 Glendearg; Suffolk £55 Edges Green and Greensburn, £54 Risehead and Fairgirth; North Country Cheviot £54.50 Kelso Cleugh; Charollais £53.50 Stybeck; Greyface £52.50 Stybeck, £52 Sheepriggs and Hesley Well, £51.80 Bayles, £51.50 Harsondale; Blackface £50.20 Gibbs Hill, £47.50 Edges Green and Horseholme, £45.50 Balmurrie; Cheviot Mule £50 Glendearg; Hill Cheviot £50 Granton and Bimmer Hill, £49 Glengeith, £48.50 Upper Hindhope; Zwartbles £47 Romanway; Swaledale £37 Broadmea, £36.50 Stobbylee. Tup lambs to £55.80 Candybank. Cast rams to £67.50 Holme Farm. Cast ewes to £53.50 Holme Farm. Cast hill ewes to £34 Ramseycleugh. The Cumberland & Dumfriesshire Farmers Mart P.L.C. had forward 1,583 breeding sheep and 88 rams and ram lambs at their Special Sale at Longtown on Tuesday 27th October 2009. Another excellent show found good quality very easy to sell at late high rates. Top of £126 for Texel ewe lambs from Kirkton, Hawick; Greyface £63 Maxton, £62 Howard House; Suffolk Mule £60 Maxton; Blackface £34 Blackburn. Gimmer shearlings to £96 for Greyfaces from Alnham Castlehill; Suffolk cross £67 The Mark; Lleyn £60 The Mark; Blackface £66 Alnham Castlehill. Ewes sold to £78 for Charollais cross from Hillview who also sold Suffolk crosses at £73 and Texels at £70. Hill ewes to £52 for Blackfaces from Alnham Castlehill; Lleyn £49 The Mark; Jacob £46 Smithy Court; Cheviot £45 Sundhope (Hume), £44 Orton Rigg; Swaledale £32 Fordlands. All classes of rams and ram lambs met a fast selling trade with shearlings short of requirements. Top of £400 for a Texel shearling from East Middle, others £380 Doorpool, £360 Searigg, £340 Old Walls; Beltex x Texel £220 Kinning Hall; Suffolk £220 Bayles; Blackface £130 Peela Hill; North Country Cheviot £90 Innergellie House. Ram lambs to £310 and £280 for Texels from Searigg, others £280 and £250 Kirkton, £260 Little Galla and Sandilands.